Can’t Find an Easy Way to Display Your Facebook Feed? Does sharing Facebook posts one by one take too long? Does Facebook’s default look not match your website’s? Struggling with the limited functionality of Facebook’s sharing? Display posts from your Facebook pages. Filter and show only filtered content: photos, video. Your feeds will look just as good on desktops, mobile devices and tablets. Choose from pre-made or create your own theme. Choose from 4 beautiful views: Blog style, Thumbnails, Masonry, Compact Album. Add Google+, Twitter and Facebook share buttons to your posts. Choose from 15 transition effects, display comments and captions. Display your page feed on sidebars. Display Facebook native videos, as well as Youtube and Vimeo. Automatically update feed content on website. If you have someone who pulls your data from facebook and posts in your website, then you can fire them. This plugin does the job neatly and keeps everything organised. You can select whether to posts only photos, videos or everything. You can also set up how often to update the news. This is really what I was looking for a long time. Thanks the developers behind this plugin! I would give this plugin developer an A plus. 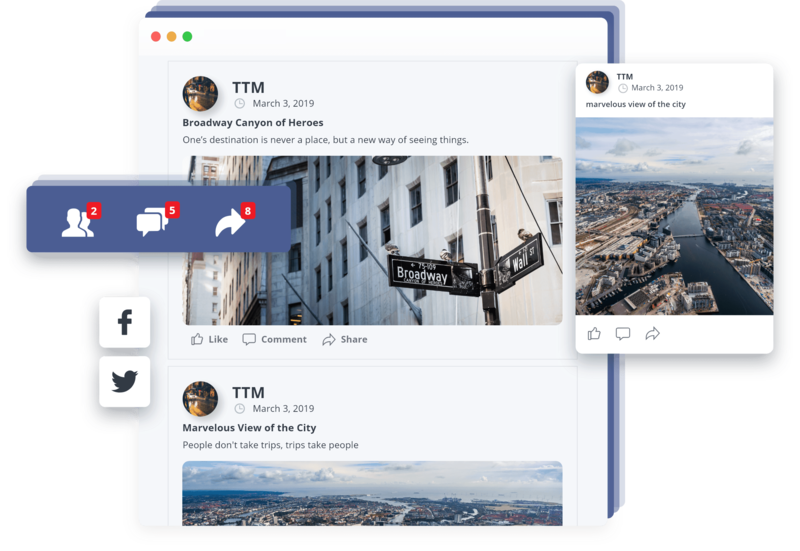 It is not just a tool for displaying the feed of my Facebook page, but an easy designer hand to style the feeds and to make them more user-friendly. Nothing more to look for. Excellent FB plugin and excellent support. Absolutely worth every penny.